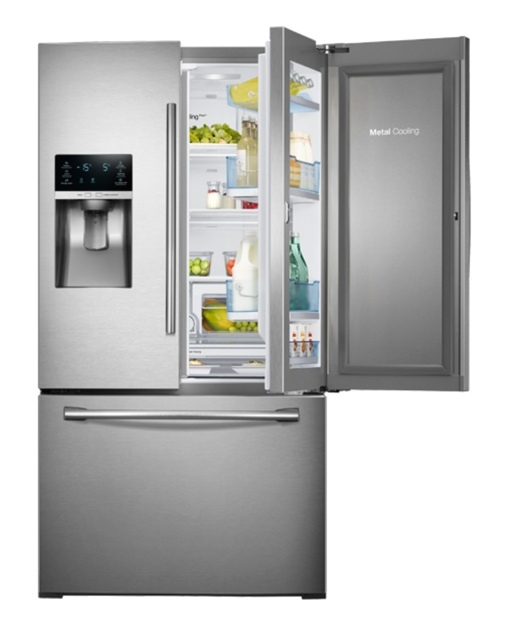 The Samsung French Door Food ShowCase Refrigerator, one of Techlicious's picks for the best tech at this year’s Consumer Electronics Show, is now available for purchase at major home improvement and appliance retailers nationwide, the company has announced. The star feature of this fridge is, of course, is the special ShowCase design that creates separate inner and outer storage zones. When you open the exterior stainless door to the refrigerator, you get to access to a few small storage shelves perfect for the drinks and snacks your family raids the fridge for the most. A second, see-through door can then be opened to access the main InnerCase region of the fridge, where meats, vegetables, leftovers and other larger items will stay nice and cold until you’re ready to use them. To learn more about the Samsung Food ShowCase line, visit Samsung’s website. And while you’re at it, be sure to check out all the other cool kitchen tech items we spotted at this year’s CES. Just got this installed today - our last fridge went bust a week ago. There’s so much more room in this and although the install guy said it needed about 12 hours to reach the desired temp, it only took 4 hours! Can’t comment on durability yet but we’re happy with everything so far.